There are two options for the 26th December in my kitchen, pasta with leftovers or pie with leftovers. 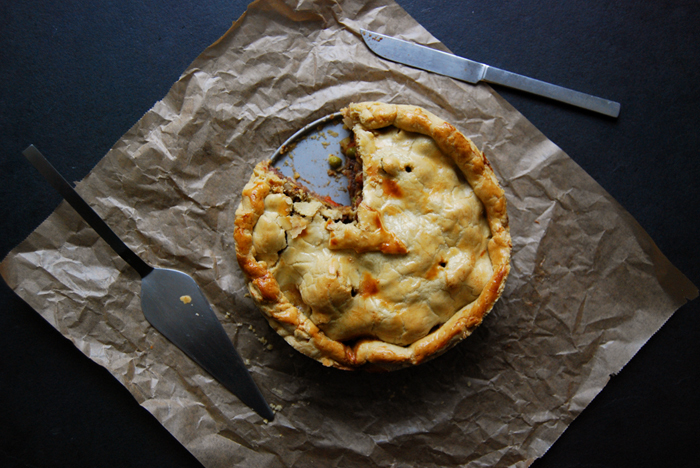 This year I’ll go for pie, a cosy Boxing Day pie to use all that meat, gravy, vegetables and stuffing. 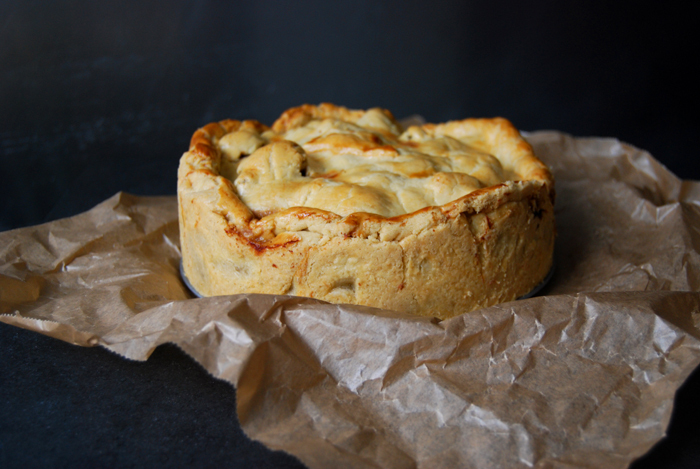 The buttery short crust holds the rich filling together, all these hearty flavours wrapped in golden crispiness! It’s so easy, you just have to chop up whatever is left of your Christmas goose, duck or stew, mix it with a couple sautéed carrots, peas and boiled potatoes and stir in some of your leftover gravy. 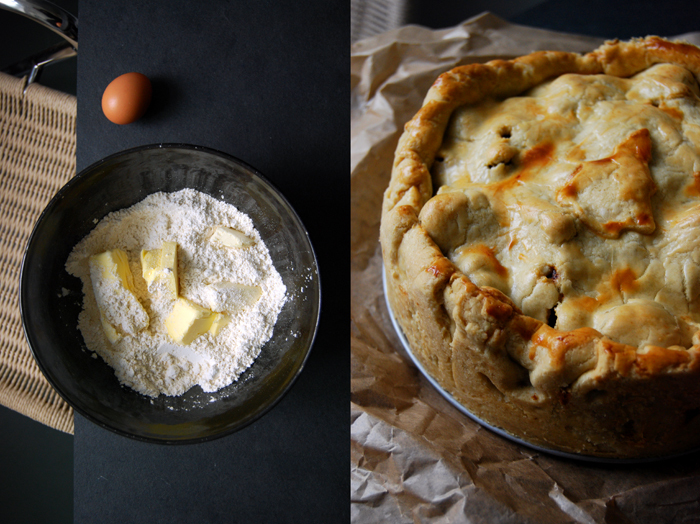 The mixture should be thick and not too liquid as this would make the pastry soggy. A thick stew is what you need. The potatoes will also soak up some of the juices so there’s no need to go completely dry. 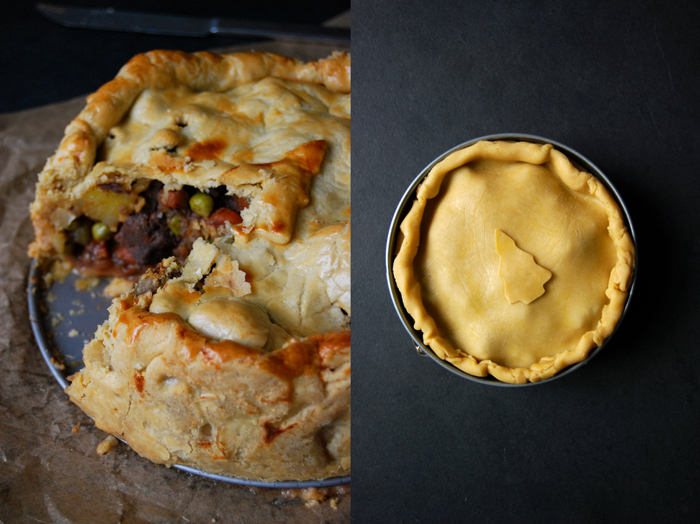 If there’s nothing left from your Christmas table (which happens to us sometimes), you can make the pie I baked last week (which you can see in the photos). 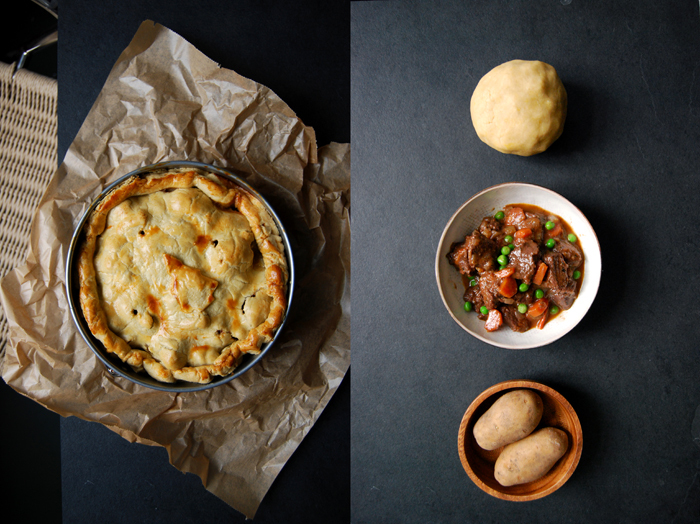 It was filled with a wonderfully tender and aromatic wild boar stew that cooked for hours. I prepared it the night before to let it sit and cool as a warm filling would soak the dough before it even sees the oven. Now I’ll go back to my sofa, cookies and Christmas carols before I put our leftover pie in the oven, to enjoy the last day of the Christmas feast. I hope you had a wonderful time too! In a casserole dish, heat a splash of olive oil and sear the meat in batches on all sides for 1-2 minutes, season with salt and pepper. Set the meat aside, add a little more olive oil and sauté the vegetables for 2 minutes, add the tomato paste and cook for 1 minute. Deglaze with the brandy, put the meat back into the pot and add the red wine, spices, herbs and mustard. Season with salt and pepper, close with a lid and cook on medium-low heat (slightly simmering) for 2 hours or until the meat is tender. Take out the meat and vegetables and cook down the sauce on high temperature for about 1o minutes or until thick and not too liquid. Put the meat and vegetables back into the casserole dish, season to taste and let it cool completely. Stir in the peas and potatoes. Combine the flour with the salt. Cut the butter and vegetable shortening into the flour with a knife until there are just little pieces left. Continue with your fingers and work the butter into the flour. Add the egg and water and continue mixing with the hooks of your mixer until you have a crumbly mixture. Form 2 discs, dividing them roughly 2:1, wrap in cling film and put in the freezer for 10 minutes. Take the dough out of the freezer, put the smaller disc in the fridge and roll out the bigger one between cling film. It should be roughly 34cm / 13.5″, big enough to line the bottom and the sides of the springform pan, overlapping the rim about 1 cm / 1/2“. Gently line the pan with the pastry (leave the cling film on the top side to put it in place) and put the springform pan in the fridge. Roll out the remaining disc, a bit bigger than the springform pan. 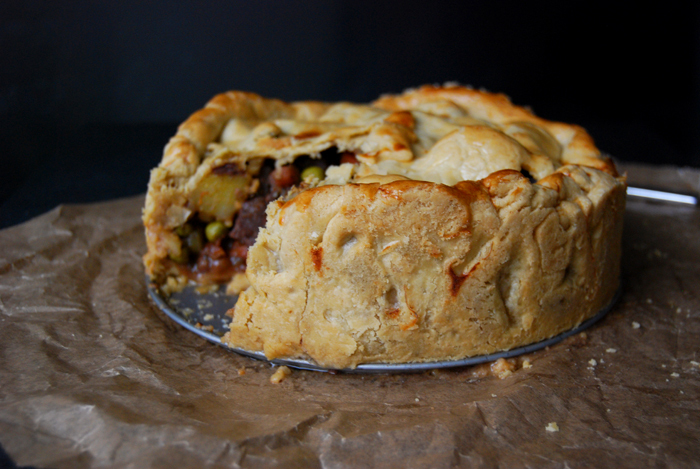 Take the pastry-lined springform pan out of the fridge and fill it with the thick stew. 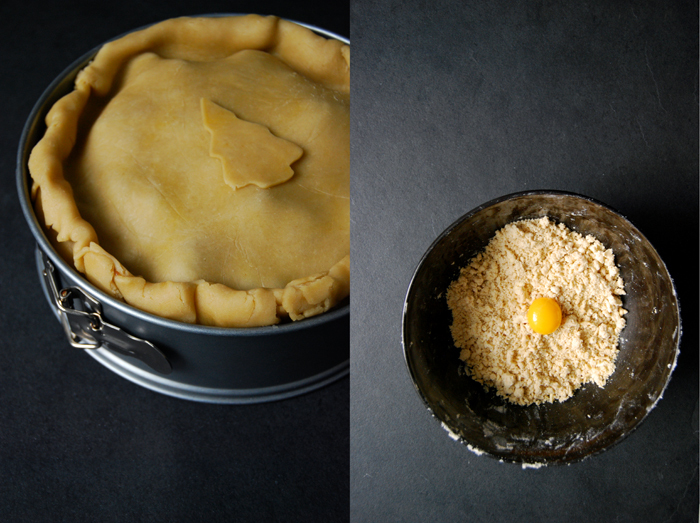 Put the smaller disc on top and gently push the sides onto the bottom layer of pastry, sealing it by rolling it inwards. Brush the top with the glaze and bake the pie for 15 minutes before you turn it down to 175°C / 350°F and bake for another 55 minutes or until golden and baked through. 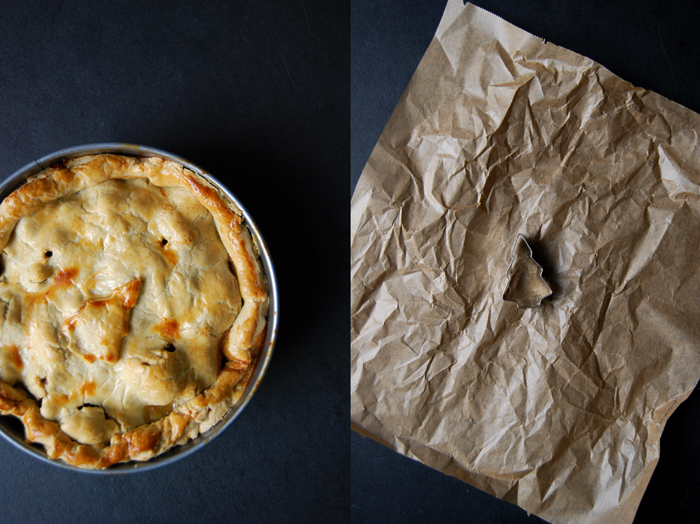 Let the pie cool for at least 20 minutes before you open the springform pan and cut it into pieces. I just came across this post through Pinterest and OMG THIS LOOKS AMAZING! So excited to start subscribing to your blog!